Aylsham stands on the side of the valley of the river Bure, and the residents of the part of the town known as Dunkirk are only too well aware that they live alongside the river itself. There is evidence close to the town, and most particularly at Brampton, of settlement in Roman times, but the name of the town is thought to be of Saxon origin. Ham, with which many Norfolk town names end, simply indicates a 'homestead', and Aegal and his family are believe to have settled there in post-Roman times - with Aegal's Ham becoming Aylsham. At the time of the Domesday book, 1086, the spellings Elesham and Ailesham are used. The land was held by Guert in the time of King Edward. As with most landholders, William's Conquest led to the loss of his lands, and Ralph Guader, Earl of Norfolk, was given the manor. However, he was dispossessed when he took part in a rebellion against King William. Domesday mentions a rector for the town, and we can therefore assume a church; it also refers to the subsidiary manors of Shipdham, Brundall and Crachefort. As with many of the other market towns in the county, the weaving of local cloth brought prosperity to the town in medieval times. Until the 15th century it was the manufacture of linen which was the more important, and Aylsham linens and Aylsham canvases were nationally known. From the 16th century linen manufacture declined and wool became more important, a situation that continued until the coming of the industrial revolution. Thereafter the principal trade of the town for the 19th century was corn and timber, together with the range of trades to be found in a town which supported local agriculture. 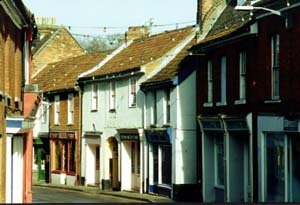 Records show that Aylsham had markets and fairs, certainly from the 13th century. Such weekly and annual events were important for the trade that they brought. Annual horse fairs would bring many other traders to the town, and the weekly market would be the occasion for more local trade. The rights of the stallholders in the market place today date back to the rights established in medieval times. In medieval times the parish of Aylsham was established as four manors, the main manor of Lancaster, Vicarage manor, Sexton's manor and Bolwick manor. The ownership of the Lancaster manor changed hands many times, before James I assigned it to his son, the future Charles I. In the course of the events which lead up to the English Civil War he had to raise as much money as possible, and mortgaged it to the Corporation of the City of London. The Corporation eventually sold it to Sir John Hobart, and through him and the ownership of the Blicking Estate, the current lords of the manor are the National Trust. The great Jacobean house of Blickling Hall is close to Aylsham. Today it is a popular National Trust property, and also stages many special events through the summer. The previous house on the site was the home of Anne Boleyn, Henry VIII's second wife. It has a dramatic symmetrical front, flanked by two great yew hedges. The Long Gallery in the house has a fine Jacobean plaster ceiling, and the library contains a great collection of books, with a special feature of titles from before 1500. The Peter the Great room shares the great tapestry of the battle of Poltawa with a similar tapestry in St Petersburg. The ancient but natural transport route for Aylsham would have been the river, but it was not open to substantial navigation. There was a scheme in the 1700s to widen the navigation from Coltishall to Aylsham, and after many difficulties trading wherries from Great Yarmouth were able to reach a staithe at Aylsham. The final end for this scheme was the floods of 1912. Road transport for Aylsham was very important. It was the principal coaching point on the Norwich-Cromer road, and the meeting point for other roads. Each day the coaches from Cromer and Holt would draw up at the Black Boys, the main inn in Aylsham market place. Coaching ended with the coming of the railways in the 1880s. There were many different plans for railways, but eventually two lines served Aylsham, with the town having both North and South stations until the 1950s. Today Aylsham remains well-known for its market and its Monday auctions. It is a popular town for people working in Norwich, but remains an active local business centre in its own right, particularly in the support of agriculture. SECTLINK('Millgate - Aylsham Local History Society'^Misc#B14879), is the story of that part of Aylsham down by the river Bure. Today Aylsham is by-passed by the Norwich-Cromer Road, but for many years the narrow Red Lion Street carried the main traffic. 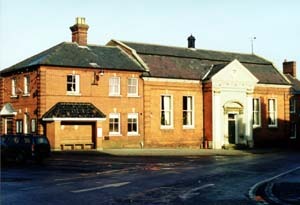 The Town Hall at Aylsham. It is difficult to claim that the architecture of the building fits comfortably in with the rest of the town, but it is an essentially practical building, designed originally to act as a corn hall and a place for public meetings and entertainments. It was built in 1857 by a private company, and bought by the Parish Council in 1908. 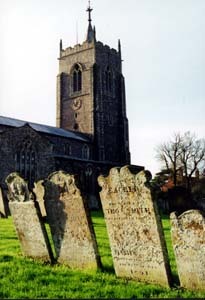 Aylsham church is said to have been built under the instructions of John of Gaunt in 1380. Parts of today's building were added at later stages, and a major renovation was undertaken in the Victorian period. 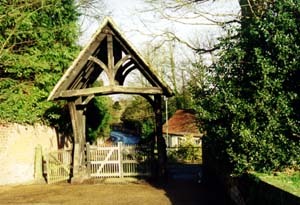 The lych gate for Aylsham church. The word 'lich' means corpse, and such covered structures were designed as a resting place for biers on their way to church. The coffin could be transferred to the shoulders of the carriers with some protection from the elements. There are many intriguing buildings in Aylsham. 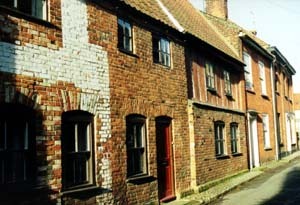 Timber framing is visible amongst the pleasant brick patterning of these houses in Hungate Street, just off the market place.